I came up with the idea, along with Sgt Wanzek, because we were missing home, farming, and the joy of growing something. 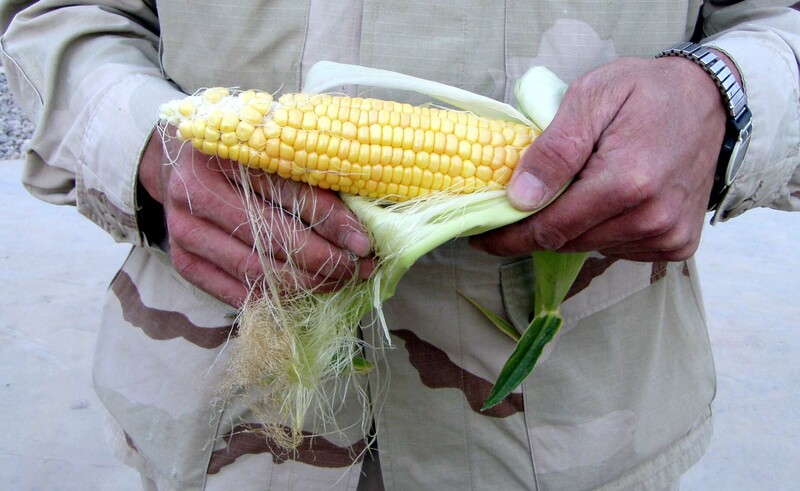 We had a spell when supply lines were all but cut by the insurgents, and I said we might be able to grow our own vegetables, since the MREs dont have them and the supply trucks werent making it to our FOB. Friends of myself and SGT Wanzek, named Nathan and Stacy Hoehn in Valley City, ND, had the seeds donated by the Valley City Nursery. The Hoehns also sent over some garden hose and a sprinkler, the sprinker we didn’t use. We learned from the locals to irrigate with deep trenches and let the water soak into the dirt in between. At 140 degrees air temperature, I suspect the water would have evaporated before it hit the ground. Sgt Wanzek has garden experience and my wife, children and I put one in every year. It is good family time and maybe in a way, the garden helped me kind of cope with missing them. I caught myself drifting back to home with the 4 of us all spending quality family time in our garden. 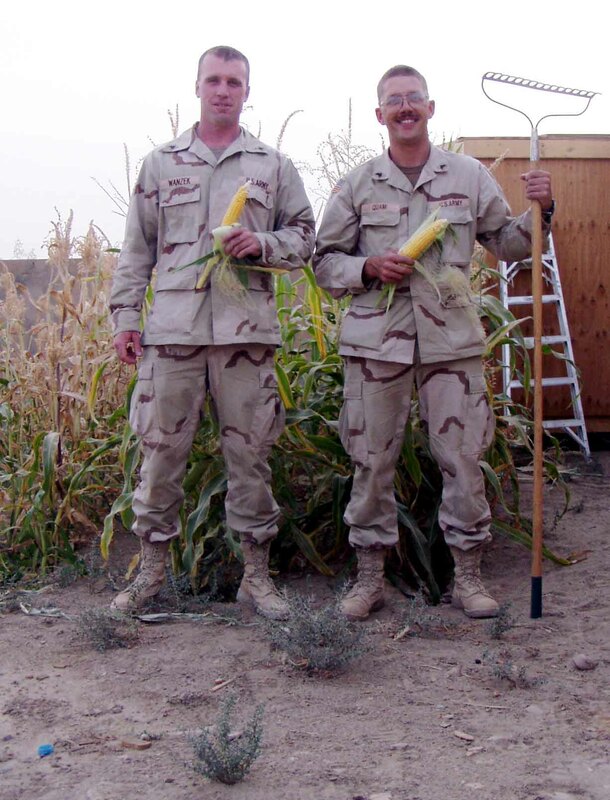 We are both very proud of what we accomplished, as Sgt Dobler’s article said, we had enough corn, beans and carrots than we could eat and started giving them away. We got a lot of looks from people and they thought it was quite an idea. I do have to add that this was done in our spare time. At the time of garden prep, planting, weeding and watering, Sgt Wanzek and myself, along with the rest of our crew, were running 4-6 combat patrols a week, in 100-140 degree weather. When we came back to our area, we had a hard time getting motivated to work and weed, but we did. Like I said, it was good therapy to relax after a day of dodging roadside bombs, RPGs and escorting semi trucks full of unexploded ordinance over the worst stretch of road in northern Iraq. The best pictures are the ones Sgt Dobler took, but both Sgt Wanzek and I would be more than proud if you use them. We are currently in Kuwait, now, waiting for a flight home. WE MADE IT!!!!!!! That is all that matters to us anymore. Out of Iraq and out of danger. . .